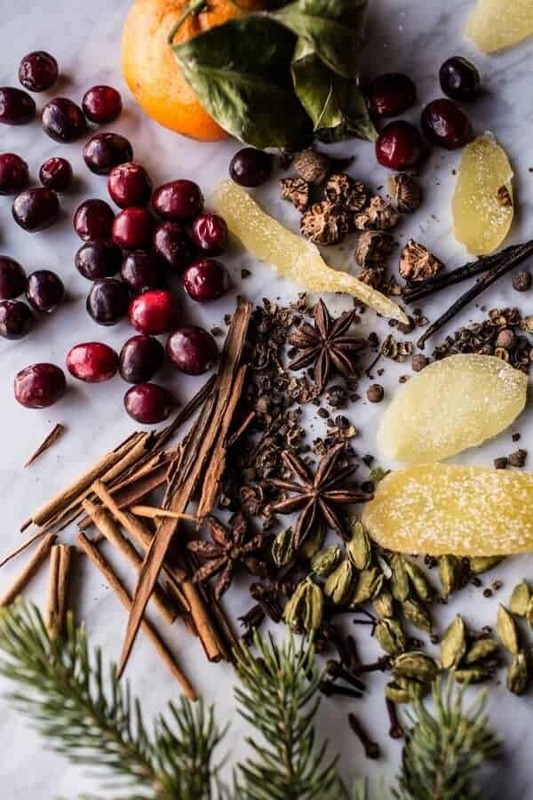 The Gift of a Christmas Scent (Homemade Holiday Potpourri). I don’t know about you, but I love the smell of Christmas. 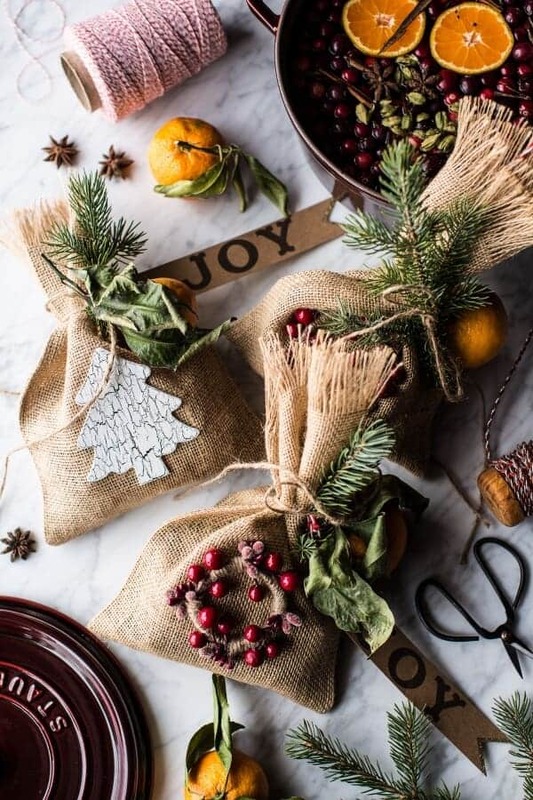 Give someone the gift of a Christmas scent (homemade holiday potpourri) this holiday season! Fresh pine, cinnamon, vanilla and orange. So fresh, yet so cozy. To me, there’s nothing better than a snow day and a pot of homemade potpourri simmering on the stove. It’s winter perfection. 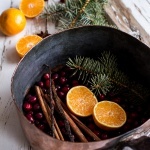 Last Christmas, I made potpourri in a pot for us all to enjoy, but this year I thought, why not take those scents and turn them into a gift for all our friends and family to enjoy as well. I know, I know, I am just so nice…right. Seriously though, this is such a quick and simple gift, I cannot believe I never thought of it before! 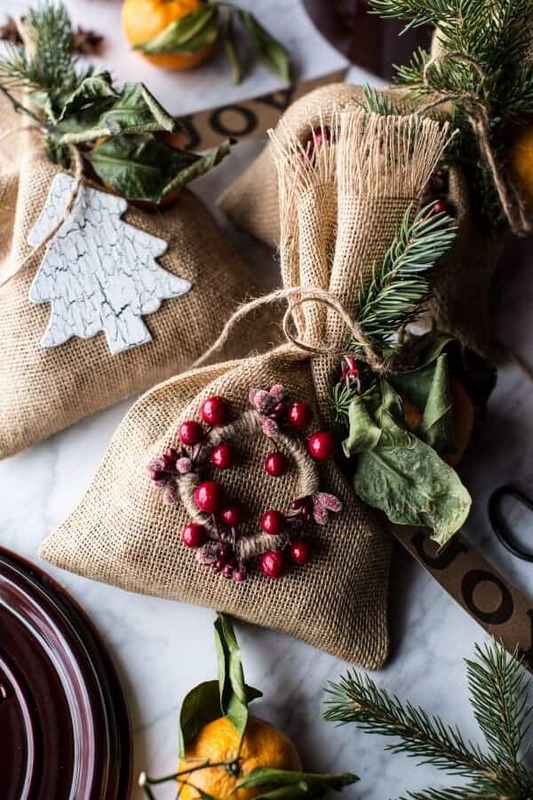 I have customized these cute little bags to my liking, but feel free to use a little more of this and little less of that so that your Christmas scent is just PERFECT for you. I also used fresh cranberries and oranges in my bag. Since I will be gifting these bags to Asher teachers tomorrow, I stored them in the fridge. If you would prefer, you can make these using all dried fruits and then you don’t have to worry about the fruit going bad. For me, the fresh cranberries and oranges make a huge difference both in appearance and in smell, just sayin. OKAY, and now for a fun/sort of serious part of this post. In keeping with my goal to really try to give back this December, today I have partnered with ZWILLING J.A. Henckels (aka my bestest buddies) to gift THREE readers one of my FAVORITE Staub pots. I’m pretty excited about it, AND you get to choose your favorite color (my favorites are the matte black and grenadine)! I know, so fun! Staub is hands down my all time favorite cookware. Their pots, skillets, and dishware are honestly the best. I know you guys will LOVE this Staub Cast Iron 4 Quart Cocotte. It’s the pot I use most in the kitchen!! Love it! While I am so excited to be gifting you guys some of my favorite cookware, I am also really excited to share a little info about the charity I am giving to this week. My mom has always made a point to give back, especially around Christmas. This year, she has really inspired me to give back myself, and today I wanted to chat a little about a charity I think is pretty close to a lot of people’s heart. St. Jude’s Children’s Research Hospital works day and night to help save the lives of thousands of children battling cancer. Cancer is something that has probably affected most us in some way or another. I know it has greatly affected my family. This is one of the many reason I feel so lucky to be able to give back and help support such an amazing organization like St. Jude’s. I was laying in bed the other night finishing up some work, I think it was like 11:45 pm and I was so ready for bed, but me being me, I just couldn’t go to sleep without a little something fun. At least for a few minutes of a Christmas movie was a must. I told myself I would only watch ten minutes, but of course I picked one of those sappy, tear filled Hallmark Christmas movies (you can watch it on Netflix if you are interested). A huh, you know what I’m talking about. Anyway, long story short, the movie was about a young boy with Leukemia. His mother wrote a blog about their journey, staying at St. Jude’s and the everyday ups and downs. To say that it was intense is an understatement. I totally cried my way through the ending, but even though the story was so sad, it was also very upbeat and positive at the same time. It’s hard to explain, and I am a horrible story-teller, but the point is that it really made you think and be grateful and so happy for what you have, you know? I really could not think of a better organization to donate to this Christmas. Kids are everything, full of innocence, energy and life. Knowing that by giving, even just a little, I can help to fund research that can potentially help save lives, is a great feeling. So today I am encouraging you all to give a little back too, if it’s at all possible! Please check out the St. Jude’s Website, watch the videos, learn about the kids and learn how you can help save a life. Sorry if that all totally sounds like an ad, BUT it’s Christmas, and it’s a time for giving, not just receiving… of course that’s fun too! To enter the Staub GIVEAWAY: tell me what is on you bucket list of things you MUST do before Christmas? Do you want to go ice skating? Bake pounds of Christmas Cookies? Decorate Gingerbread houses?!? 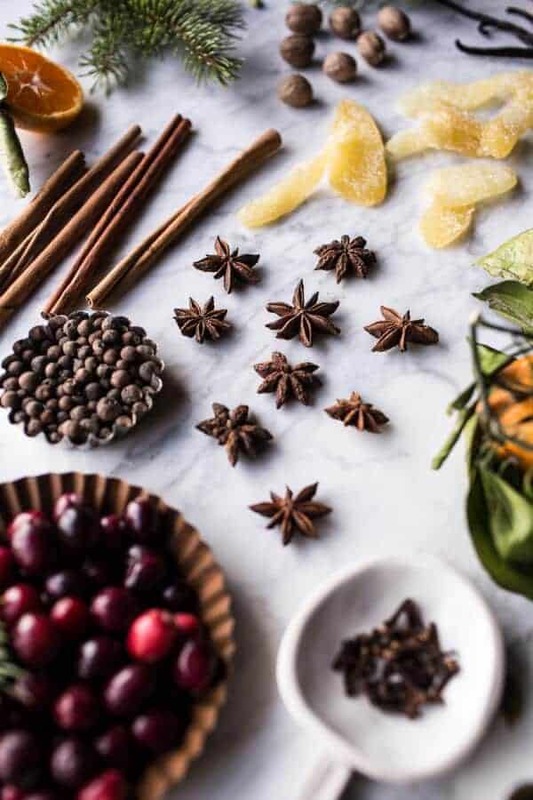 Make Christmas Potpourri for gifting?!? 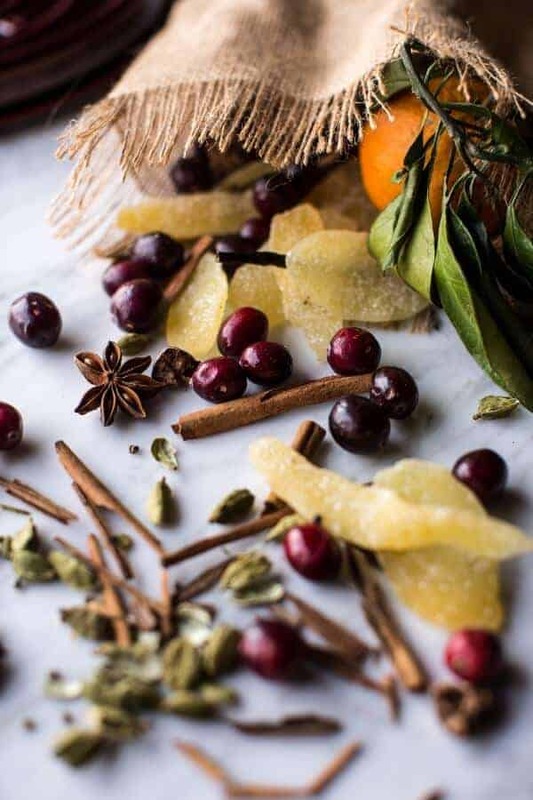 Give someone the gift of a Christmas scent (homemade holiday potpourri) this holiday season! Combine all the ingredients except the orange in a burlap bag or glass jar. If using a jar, add the orange and seal the jar. If using a burlap bag, tie the sack shut and then tie the orange onto the outside of the sack. You can also just place the orange inside the sack. Decorate as desired. 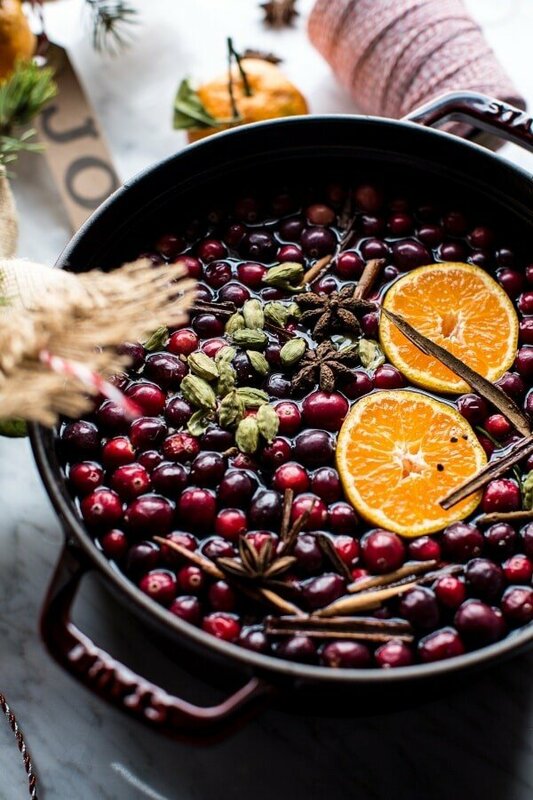 If using fresh cranberries and oranges, gift the potpourri within 2-3 days of making and keep stored in the fridge. If you use all dried fruits, the potpourri can be stored at room temperature for up to a month. To make the Potpourri, add the contents of your bag (or jar) to a medium size pot. Add water until it comes 3/4 the way up the pot. Simmer on the stove over low heat, adding water every so often to keep it from drying up. If only you could smell my potpourri simmering away. SO Christmasy!! P.S. Isn’t that Staub pot the most beautiful thing ever? It’s really a work of art! I know I have already said this, but it’s my favorite! 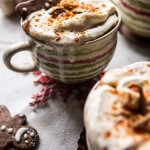 Gingerbread Latte with Salted Caramel Sugar (VIDEO). Coziest Homemade Hot Toddy Kit. potpourri sounds like a great teacher gift- so much more unique than chocolates or gift cards (which i inevitably gave to mine anyways). my bucket list for this christmas is to play with meringue. preferably that would mean perfecting macarons, but if that doesn’t work out, i see marshmallows and/or meringues popping up in the near future. On my bucket list of things that I MUST do before Christmas: Bake White Chocolate Gingerbread Blondies, finish wrapping presents, and finish mailing out Christmas cards. I have already started the baking spree! My bucket list is to make a recipe I saw for Homemade Chocolate Liqueur to give to friends at christmas…Thanx for the chance to win. What a question! Where would one start lol! I atm live in the Czech Republic have an address and home in America. I have been here for 4yrs and will be going back to the States soon (sad/happy feeling). Holidays here can be difficult to achieve but I have every year keep/kept “tradition” for the family(kids). All the way from Thanksgiving(which doesn’t exist here and very difficult of finding American food…all from scratch)…hence “difficult”. My simple bucket list would be for my kids to remember the whole point of doing what we do for each other in celebrating together the holidays. And they share in their future holiday traditions. Merry Christmas and Happy New Year. Thank you for this recipe it is perfect. I am having an open house next week and I having been trying to think of a thank you gift for and this is a perfect idea. I m going shopping today along with decking the halls of our house. I will definitely look at the St. Jude’s link as our Charity this year. I need to buy presents for the grandchildren and bake Ginger strips. I’m rather new to this blog, but loved seeing some of the beautiful pictures of your dishes. I can not wait to try out more! For my bucket list, I plan on making some music with my colleagues at the American Cancer Society Hope Lodge in NYC. I have a brass quintet that I often play with, and this year we are volunteering our services at this facility to share a little light to those friends and family who are burdened with this illness. I am looking so forward to sharing our gift during this time of year and to see the smiling faces at those who deserve a little happiness in their life. This looks gorgeous and like it would have a wonderful smell. My family celebrates Hanukkah, which starts today ?, and I wanted my daughter to feel that her holiday is just as special and magical as Christmas. Very hard in a small town where we r pretty much the only family that does not celebrate Christmas. I feel this was accomplished as we decorated like crazy in blue and white, made dreidel shape cookies and just spent time together as a family. I hope I have a wonderful day! Can’t wait to make this, love your recipes! This Christmas, God has really put on my heart a friend who has recently lost her husband to cancer. I am going to make this (and several other recipes of yours) to bring to her and her daughter. Christmas is a wonderful time of year, but they’re really hurting, and I hope to help, even if its just a little. Thanks for all the great recipes and ideas, I love your blog! 1. Buy and create gifts that support our local young farmers. 2. Drive to our farm in Wisconsin and hang our Xmas wreath on the barn. 3. Create memories that will last far longer than the gifts under the tree. This is Christmas in a pot!! 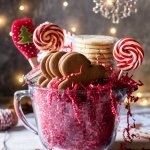 For my Christmas bucket list, I want to make homemade edible gifts for my work colleagues! I have yet to choose what to make- there are just so many great options. Fudge, cookies, brownie squares, bark, hot chocolate mix… I’d love to include a homemade sugar scrub in a festive scent, too! Never thought of a ticket list but… I would love to make some cookies and maybe fudge that I have never made before. Childhood cancer is one of the most devastating things I have read about. I keep up with many Caring Bridge site families. Many of them are children with cancer or ones that have passed away. It is so sad. Very little funding goes to childhood cancer. So sad that so much goes to Susan G Komen Pink ribbons but not much at all do you see for Gold ribbons which is childhood cancer. Would love to win the Staub’s giveaway. Thanks for the chance!! I want to sew aprons for the grand-kids and spend the week between Christmas and New Years Day baking with them. It’s always a sweet part of my day to read your blog and look at the gorgeous pics. Thank you for the opportunity to win your favorite pot. I love the grenadine! I plan to keep it easy and stress-free this year. My almost -three-year saga of a divorce is finally final so I can make Christmas just the way my kids and I like it. Baking cookies, (hiding some in the freezer so we actually have some left for Christmas Eve and Christmas Day! ), playing games, only putting out the favorite decorations, evening drives around neighborhoods looking at all the Christmas lights, watching movies, and hoping for a snow day or two. Merry Christmas to you and your family, Tiegan. I inherited my grandma’s date-pecan roll recipe and make it every year to gift to family and friends. It is the one thing I must do between now and Christmas. Wow! do some of you on this list not sleep??? commenting at 2am? !…anyway, this is a wonderful idea, and as a teacher I would be happy to receive this. Things are so crazy at school during this time that I don’t get much done at home before Christmas arrives and the delightful smells would get me in the spirit and motivated! 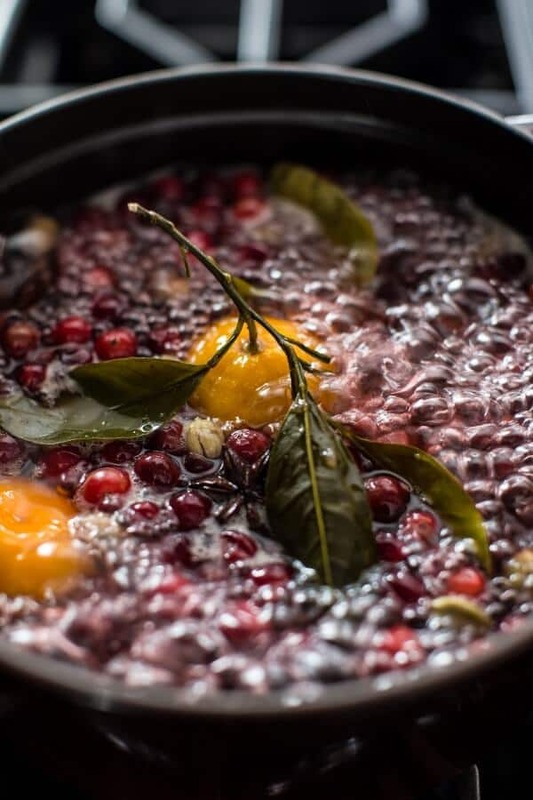 My bucket list includes making my Cranberry Chutney for all the neighbors and friends. I first tried this in 1984 (a gift from a neighbor of my parents) and started making it the next year for my neighbors. Everyone LOVED it and waited each year to receive it. My original neighbors have aged, moved, or left us, and the neighborhood is now full of young families that I think will like this traditional gift. Oh my gosh! I have to confess my love of Staub first! I have the pumpkin cocotte and it makes me feel like I’m in Cinderella’s story every time I use it. On my Christmas bucket list: going to a Christmas tree farm to cut down our tree (TODAY! So excited! ), making my own egg nog to have while decorating the tree (best recipe ever if you want it), making needhams which are a Maine tradition and are basically a mounds bar but made with potatoes to make them extra creamy, and making gingerbread men to bring to all my neighbor’s. This time of year is the best! Oh, and we are doing the Math-a-thon for St. Judes in our school, too! Before Christmas what I have to do is make one or all of the following for the volunteers in my life – hot cocoa, pancake mix, granola, sugar scrub, sugar syrup, cookies and brownies. The men I live with, spouse and son, are not into the holidays so I try to make the most of the people in my life who do. I plan you take a little time off & have some long over do lunches with friends…in addition to all the yummy treats I will be baking. I make the best chocolate chips cookies in the universe (just ask my sons) & my banana bread has no equal. A Staub pot would be so lovely to use now that there is finally a chill in the CA air…stews & chili. I am a nurse & deal with the devastating effects of cancer daily…thank you for shining a light on this for others to consider helping. We love to go see light displays! Thank you for giveaway. Tree is up, house is decorated, holiday music playing. I work in retail full time so the holiday season is nuts. I am hosting Christmas this year- I have my menu planned and I get as much done in advance so I can enjoy the time with my family and closest friends. Love your blog. Happy Holidays! I need to bake your slice n’ bake cookies and gift them to all my family/friends! 2). Sliiiide around the house in those fuzzy socks. 3). Give gifts other than candles this year. My Christmas bucket list includes making Christmas cookies with Shannon, and twins Tyler and Gavin. Thanks for the chance to win the pot! I love the matte black … black is my favorite color! Also, we give to st Jude’s several times throughout the year. Basically when they send us an envelope, we send a check :). My favorite charity. Both of my adopted daughters want to bake this year, so breads for their teachers, cookies and small cakes for the neighbors are all on the bucket list. Then there is travel–about four hours away to see a half sister who is in difficult times. We will take her to see a sculpture garden, walking through a mile of Christmas lights, and then dessert at an 1880s style bakery. This will be the last Christmas before the half sister ages out of the foster system, and we are not sure she will keep in contact with her sisters. So we are out to make a memory for this one! This is wonderful. Thanks for the call out for St. Jude’s! Every year at work we vote for a different charity to donate to – this year was St. Jude’s! Before Christmas, I want to bake my favorite ricotta cookies with my mom. I miss that beautiful woman and her awesome kitchen! I love these photos!!! My must do this year is looking at Christmas lights! And thank you for donating to st. Jude’s and encouraging others. We do every year and it really makes the holiday season so much more special <3 crossing my fingers!!! There is a famous street in Baltimore in the Hampden neighborhood called 36th St that goes all out with their Christmas decorations. I would love to go see it before the holiday is over. Well top thing on my bucket list is to shop for my wife. Typical guy I guess, I always seem to wait till the last minute. I also want to make up a big batch of IPA peanut brittle to share during the holidays. The thing I must because I must do before Christmas this year – aside making and baking gifts for friends and family – is finally sit down to skype my sister and her children whom I haven’t seen face to face in way too many years, since they live in another country and none of us can afford to travel to one another’s, so even though we call each other every weekend, I really just want to see all their faces before Christmas, even though I know I’m gonna cryyyyyy like a mad woman, and even though I see them through a laptop screen. Before Christmas, I MUST: Finish shopping for presents (I am waaaaay behind) and have a very belated Friendsgiving with my best friend/maid of honor/roommate! Thank you for such a wonderful post Tieghan! I find your blog inspires me to make wonderful dishes and now to give back too. I work for an organization that supports St.Judes each year, and I gladly donate during that time. There is a farm that the public can visit, it has homeade cider, cider donuts, and hot chocolate. There is also a train that you can ride on and other fun things that my child who is 5, would love to visit. That is what I’m planning to do before Christmas! My bucket list item is making and canning a big old batch of applesauce to gift. My bucket list item: bake A GAZILLION COOKIES for everyone I know! Also, catch up with a few friends I haven’t talked to in way too long. This Christmas , my to-do list includes making my own ornaments! It’s something I’ve always wanted to do- something that could last generations. What a wonderful post Tieghan! My bucket list before Christmas is a simple one, to enjoy each moment with family and friends. To not rush through the holiday season. And also to make your yearly family Christmas trip into NYC! 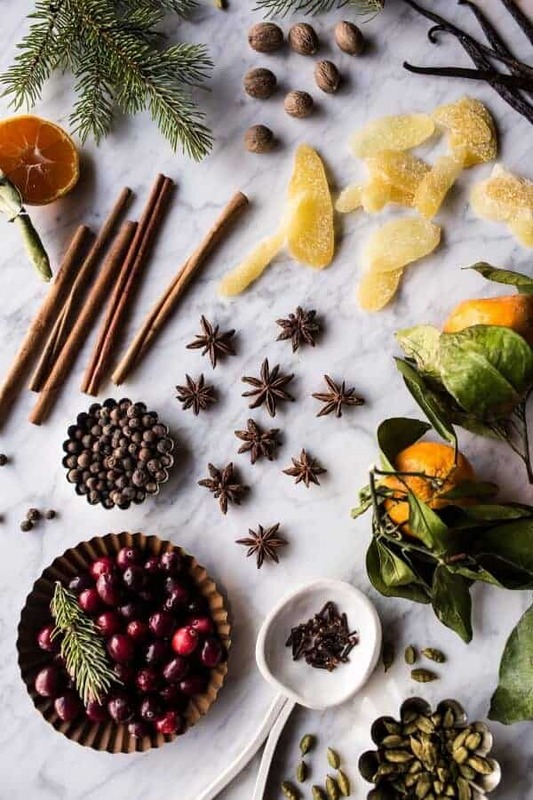 make a batch of mulled wine with all those potpourri spices for our holiday open house! On my 2015 Christmas bucket list is to make, rather than buy, most of my holiday gifts. Wine cork letters, wreaths, and now, this wonderful potpourri (which would of course be complimented by that stunning Staub cocotte). Happy Holidays! It seems like the greater part of my Christmas Bucket List is reserved for school stuff… the papers are interesting, but still exhausting! Otherwise, though, I’m counting on hosting an inner child study break for the undergrads (thinks Legos and colouring sheets), making pita chips and dip for an end of year class event, and plan and execute some delicious meals for my family. On my bucket list are Holiday Stollen for all of my clients (I’m a personal chef) and some yummy mulled cider! I’d love, love, love to win a gorgeous Staub Cocette so I can use it to prepare delicious warming foods for all of the families I cook for! gingerbread houses are a must! OMG, I’m super excited to tell you about my plans. In this last year, I got married, got pregnant, quit my job, and moved across the country to live in my husband’s home state. I’m trying to make a good impression on his friends and family so have setup 5 nights this month to entertain. My plan is to provide nice winter comfort food and have a “craft” to make. I was going to use your gift jars and will also now do potpourri! I am going to provide all of the materials necessary and ask that each person give a donation to the local food shelf (where the news is reporting empty shelves). This is BIG news for me as I’m the typical accountant at heart. I lack creativity and entertaining skills. But, your daily emails have inspired me to entertain – not with confidence quite yet but at least I know that I’m providing yummy meals and fun activities! My primary bucket list item is to carve a wooden spoon for my mom and an ornament for my dad. And to bake lots of cookies and make other yummy things! 4- take advantage of the crisp, winter weather and spend LOTS of time OUTDOORS! Instantly, I know what I want to do before Christmas……take my 6 nieces and nephews skiing at Big Sky Resort and then make fabulous Christmas cookies in my decorated holiday-spirit cozy house with the fire a blazing. Then, watch Rudolph and The Grinch! My bucket list is to take time off work/school to spend with my family, especially my sister and niece to be. Thank you so much for posting all the incredible recipes! At the top of my holiday bucket list is taking my kiddos to see Zoo Lights at the Oregon Zoo! Get the piano tuned and play Christmas carols with the smell of potpourri in the air. Making your crescent cashew cookies with my grand-girl. She just turned 1 and I know she will love dipping the cookies in chocolate and putting pretty sprinkles on them. I love all of your photos and recipes. Thanks for the inspiration. I plan to have family and friends to our home to celebrate the Christmas holidays. I have selected so many of your recipes to share with them. Thanks for the great ideas! 1. Make this potpourri this morning so we feel super festive while gingerbread house decorating with the 7 yr old. 2. Make homemade pate recipe for our own giveaway with the husband. 3. Cut down a Christmas tree with the fam. 5. Roast a 30# pig Christmas Eve for huge family dinner! 6. Go to NYC for a New York Christmas night out with friends! Thanks for this great post! Going to try the sangria recipe with our Christmas pig too! I think of the cartoon version of the Grinch and think Christmas should come from the heart. Children are the heart of Christmas and there are so many good ways to help them at Christmas and every day. St. Jude is a great one. Here in Cincinnati we have the Ruth Lyon’ s Christmas fund that helps hospitalized children with toys, activities, and play rooms. I’ve always been a fan of St Jude’s. They do such great work for kids and their families. And so over the years, when I can, I donate to them. This year is one of them =) This year, I’ve also donated hair and money to Children with Hair Loss since it seems like such an important organization. And on Black Friday, since I was out shopping anyway, I took advantage of the sales on kid’s toys. That way I can buy more to donate to toy drives. It’s sooo important to give back and I’ve been encouraging my readers to do the same. As for my bucket list, finding the perfect gift for everyone! It’s sooo hard to shop for people sometimes! And I can’t wait to make this potpourri for gifts, Tieghan! Top priority is to take my young nieces to the Nutcracker. So much fun! Thank you for this post! Such a lovely idea. Will definitely be making this. Love the focus on St. Jude! It is a great organization. So far we have decorated a tree and a gingerbread house. The biggest thing that leaves on my bucket list is hosting a cookie decorating competition! I work in a kitchen that uses staub cookware for serving… And I have always loved them! They are beautiful. I am also super excited for this potpourri gift idea, I think it is a great teacher gift, very unique! And I want to try it out in my own home!! As for my Christmas bucket list- I just want to find everything on the kids’ wish list, but on sale…. I love getting a deal ? also, I want to find the time to finish decorating, I am also a hopeless procrastinator, but I love the feel of a home decked to the max in Christmas decorations!! Bucket List: Take my mom (who is visiting) on a tour of all the holiday trees in NYC! Hopefully with some hot cocoa and holiday music. Only thing on my list is to stay sane during this stressful season! It’s almost too late now but I really want to get a batch of fruitcake going. Nothing says Christmas like fruitcake! On my Christmas bucket list, I want to finish sending out Christmas cards, make your caramel/peanut butter/chocolate truffles as a gift for my coworkers, host a secret Santa holiday party, and make my family’s dressing recipe for Christmas day! My mother always told me to “give back” as it will come back to you. She had 20 yrs sobriety, and had reconnected with children (myself and my 2 brothers) she had given up when we were little. My goal “my bucket” list has been to touch others with her message. When someone says “how are you” I always ask “and How are You?” Most often I am thanked for my care. Little things. I truly love your recipes and beautiful pictures and enjoy cooking for my friends and family. I am often reminded on how blessed we truly are. The last thing on my bucket list before Christmas is to get all of the Christmas cookies baked! I CAN smell the potpourri because I have my own simmering, although it’s not in a STAUB pot. 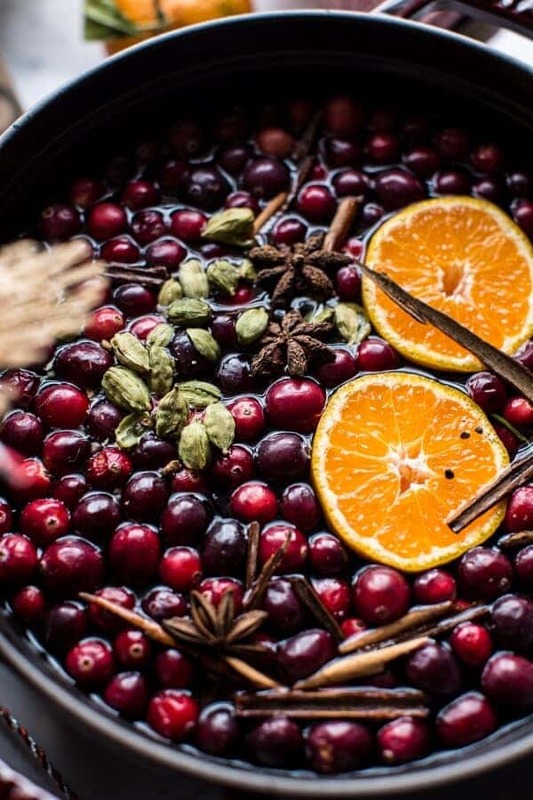 Have always made cookues, breads, candy to gift…..but this year adding home made bath and aromatherapy products, too…..and cranberry moonshine and lemoncello……so much to do ! Happy Holidays to all! Before Christmas, I want to decorate my new place with my HUSBAND (just married last month) with all sorts of holiday decor. So excited to have our first Christmas together as a married couple 🙂 . St. Judes is a great organization, one that I supported since college with my sorority’s philanthropy. Thank you! We are trying to get started on our to do lists this weekend. Lights and decorations are going up and plans for our traditional yearly cookie day have been made. Thank you for the spotlight on St Jude’s. It does remind us about what is important at this time of the year. Happy holiday to you and your family. I adore simmering potpourri for giving as well as receiving! I love going through all of my spices and perfecting my perfect smell. On my bucket list is making my very own buche de Noel including my very own meringue mushrooms. Hope you have a lovely Christmas! My bucket list is to just get all of my gift shopping done early so I can relax leading up to Christmas! My main wish as I work my way through the usual list of cards and gifts to make/buy/send (this week, hopefully!) is that l notice the little joys of this season. I am already baking Christmas cookies to give to family and friends. That was a top priority on my bucket list. I am going this afternoon to a church Christmas concert and that will really put me into the Christmas Spirit. I am hosting Christmas dinner and I will be getting ready for that with shopping and cooking. Time spent with family and friends is always at the top of my list during this wonderful time of year. I will be having a baking day with my family. We do it every year and make lots of Christmas goodies, including pecan pie, fudge, and caramel apples. It’s always a fun way to spend more time with my family. I LOVE THE CHRISTMAS SEASON!!! Rather than bombarding my 2 year old with presents (because we have 4 Christmases-and he receives gifts at all of them), my gift to him is an activity/craft/sometimes a small gift every day in December. Some days he gets to have the fun, other days we will be doing something nice for someone else. I incorporate our Elf on the Shelf and he is having A BALL with it…and so am I! It is forcing me to slow down and present with him during the day instead of rushing around checking things off a list. He gets to experience the giving and receiving!! Love that you chose St. Jude!! St. Jude is BIG where we live. There is a local Children’s Hospital and our community supports St. Jude in a great way! We’ve already made our donation to them this year! I am really behind on Christmas prep. I have to start baking, and I’m attempting to get the family to provide me with their personal lists of “What *MUST Be Made” so that I don’t miss out on all the favs. What a fun chance to win! On my bucket list is to take my girls sledding & then gather back home with homemade hot chocolate & marshmallows by the fire while we laugh & tell stories about our day. Always love these moments with my kiddos. And to top it off, a new grandbaby! So lot’s of special days ahead. Really enjoy your website and all the amazing recipes! Christmas always is a busy time of year but makes me feel so good and cozy. I have such wonderful memories from my childhood and now that I have two impressionable teenage daughters I hope to give them the knack of baking because it is such a big part of making those memories. Thank you for you inspiration daily….they both like looking through this site. Happy Holidays!! This potpourri sounds lovely! I’m going to try it. We finally got our Christmas tree decorated today, so it’s feeling very festive at my house. Other things we MUST do are making peanut butter blossoms, watching It’s a Wonderful Life, and playing carols on the piano. My Christmas Bucket list is to make a gingerbread house from scratch! Not a big one, start little as I have never done it before, but I think it would be fabulous to have one completely homemade! Happy Holidays! Baking tons of cookies and making caramel sauce for gifts are on my Christmas bucket list! This is a great gift idea! I always love coming to this blog (the recipes are fantastic but the photography is just wow.) My bucket list for Christmas is to donate $100 more than I did last year. I always take and angel tree or donate or sponsor people because I believe in helping people alot. Being a college student, its a bit difficult, but i want to try! And Im actually almost at my goal! Listen to Michael Buble’s Christmas album and be home with my family (my grad school exams go up until the 18th, so it only gives me about a week of Christmas!). On my bucket list is my hike with my younger brothers to cut down our tree. We all love searching around for the perfect one before finally deciding…and I love that they’ll drag it back to the house for me. I really want to make a bunch of DIY gifts for my friends and family, as well as give back to my family’s closest supporters by making them a bunch of homemade Christmas treats and breads ? Lots to do yet, finding a live tree, Christmas cards, baking and decorating. Presents are just about done, so doing well on that front at least! What’s on my bucket list? Too any things. But one is really important: to see my family again after a very long time. This year on my bucket list is to start a tradition of baking goodies with my toddler. She’s been showing an a interest in the kitchen; always reaching for her stool so she can get a better look. Plus I figure since I come from an extremely small family I should probably make a BIG deal out of the holidays- so Christmas treats shall commence! I think that’s so awesome that you’re donating to St. Jude’s Children’s Hospital. That’s really such an awesome way to give back. Make Christmas cookies with my mom, sister, and grandma! It’s one of my favorite Christmas traditions. Also my husband and I still need to get our Christmas tree. Maybe tonight! A lovely recipe and call to action. St. Jude’s is such a blessing for so many families! On our before-Christmas bucket list is making candleholders to send to our loved ones as gifts, since we won’t make it home for the holidays this year. Thank you for such a fun adventure in finding your blog this past fall. I have never used Staub before…that could be something on my bucket list …but not necessarily before Christmas. My bucket list is to prepare our home for the return of our 2 oldest from college with warm holiday memories and enjoy the time together, in the moment. Laughing and music and food will be front and center. Before long, they will be out and about with their own families and traditions…I plan to savor my time and not sweat the small stuff as best I can. My bucket list has always included making tons of cookies and a couple of candies. My children have several favorites and would not think it was Christmas without them. St. Jude is one of the charities we always support at Christmas. What I love and is always on my bucket list is to bake for people that don’t normally bake or cook. My reward every year is the smile on their faces when I drop off a plate of cookies, bread, homemade fudge….etc…to my neighbors and friends. I love to give! It’s just in me I guess. Like St. Judes and United way, every year, just knowing you’re helping is the best feeling! Oh I am making your roasted chicken tonight! Merry Christmas! My must do on the bucket list this year is figure out a way to get my kids’ gingerbread houses to stay together for more than a few hours! Ha! It’s so sad to see the roof cave! This looks like it smells wonderful! I can’t wait to try it out, I love Holiday scents! On my Christmas to-do list is to bake several new types of cookies for my grandparents! My sister and I always put together gift baskets of baked goods for them every year. Get my chili made for Christmas Eve. Your photos are awesome, creative, and mood inspiring. Going ice skating and volunteering at our local Christmas for Children gift drive are on my Xmas bucket list! Thanks for the lovely giveaway & happy holidays! My Christmas bucket list is to see the Christmas windows in NYC. I really want to go snowshoeing and attend a few Christmas Markets with my sisters! 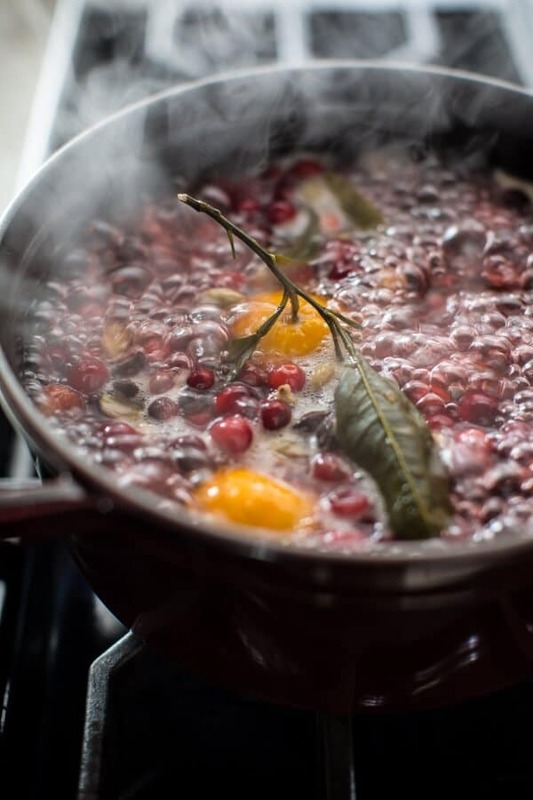 On my bucket list this Christmas is to try & make my own cranberry sauce (check! Done! Delicious! ), find a new cookie recipe for Santa, & make this Christmas everything my little one wanted that’s filled with memories ? There’s always too much on my list this time of year…but I always knit or crochet my hubby and sons something each Christmas!! Love the “smells” too. Great recipe. And I’ve been donating to St. Jude’s for years now. Thanks for the chance to win…Merry Christmas! Number one on my bucket list is to see tg3 Christmas lights! We have a neighborhood that does an incredible job of lighting up their homes with lights and I look forward to it every year, especially now that I have a baby to share it with! My personal tradition is to watch ALL of the Harry Potter movies while making Christmas gifts for my friends/family. My usual, which is what I’m making this year is homemade cocoa mix packed in jars with homemade marshmallows. I always associate Christmas with Harry Potter since that was usually when the movies came out and I’d go see them with friends when I was on break from High School or College. On my Christmas to do list is family pictures. I am planning it as a gift for family so I better get them done soon! On my bucket list I want to finally learn how to make fudge! Homemade vanilla extract and challah bread are on top of my bucket list for this Christmas. I’ve recently tackled vanilla extract and can’t wait give it out as gifts to friends and family. Need to get working on some challah bread ASAP. Thank you for the awesome giveaway! Bucket list: organize some visits with friends I don’t see very often, and prepare some treats for them based on the food-memories we’ve made together! I want to crochet a garland to decorate my new apartment! I’m thinking I might make snowflakes with some festive white yarn flecked with silver. This year the only “bucket list” item I have is to truly enjoy the season- no stressing over silly things. This is the first time in 6 years we are staying home- not traveling- and allowing our children to have a relaxing Christmas Day! I love all f your recipes and ideas! I also love the idea of a holiday bucket list. On my bucket list this is year is to come up with an epic holiday feast menu for Christmas and spend some more time at my local food bank educating people in the community about the importance of healthy whole foods! This is when you wish your phone or computer screen was scratch and sniff!! On my Christmas bucket list is to create a bird tree with my son. We started the tradition two years ago. We string popcorn, cranberries and oranges for garland around the tree and make ornaments with bird seed, gelatin and peanut butter. My four year old loves watching the birds from the window enjoy their treats. It’s Christmas for the birds! Thank you for sharing! Our family’s Christmas bucket list include pictures with Santa for our baby and preschooler, baking lots of cookies, ordering Chinese takeout on Christmas Eve (it’s our tradition), and hand wrapping and decorating presents for our family and friends. I’m def gonna make this potpourri…and I’m already a big contributor to st. Jude’s! Apart from the usual – buy a real tree, gift shopping, (not making anything handmade this year) except for photos that I have to frame. I really want to bake some new cookies that I have never tried before. I have already made three different kinds of shortbread, but want to try something new. Oh and the potpourri looks heavenly so might have to give that a try too. Thanks! My father-in-law can no longer cook/bake. No one else in the large family really cooks too much except me! So I am going to attempt to make him cookies from his youth- a norwegian sandbakkle. Hopefully they turn out for him! I love your recipe idea – although I don’t think I could use a vanilla bean in potpourri – just too valuable to use to eat if I had one. Haha! This is a great gift idea! I’m looking forward to making Christmas cookies with my mother in law for my coworkers. It’s a new tradition in our family. I have to see the Christmas tree in Cleveland’s public square with my friend! I still need to get started on my holiday Christmas cookie boxes for friends and family! Baking gobs of Christmas cookies is on my bucket list before Christmas. This potpurri looks pretty darn good too. This is absolutely gorgeous! And such a perfect gift. I love the mentioning of St. Jude’s. That’s a charity that we always donate to 🙂 Christmas is definitely a perfect time to give. Now I’m off to gather items to make this wonderful potpourri! Before Christmas my family and I need to watch “It’s a Wonderful Life” and set aside a Saturday or Sunday to bake as many cookies as we can! I have plans to make some homemade food gifts, like an organic trail mix, biscotti and your recipe for nutella. I will be searching the woods for natural sources for some Christmas decorations. One day for baking cookies and watching the a few Christmas movies. I plan on giving to St Jude as they are one of the charities where their revenue goes directly to the children and their families. My children and I have to drop off a large Santa bag of much needed items to a local dog rescue group. Also, I will going to as many Christmas lighting events as possible, as one can not see too many Christmas lights! Potpourri looks amazing! On my Christmas bucket list are making and decorating Christmas sugar cookies with my family and donating a couple toys to families in need! Those pots are beautiful and I love your potpourri recipe! I’m hoping to make and decorate sugar cookies with my two year old son before Christmas. My mom did it with me and my siblings every year and I can’t wait to carry on the tradition with my babe. Uh, I can’t decide…ideally, I’d like to get my driver’s license before Christmas, but a more realistic to-do goal would be writing a bunch of overdue thank-you notes I have. I’d love it if I could do both! My baking ingredients are being packed in my suitcase so we can make some family favourites together in New Zealand. The very best part will being together but there are so many memories in the traditional Christmas specialties. Love baked in every bite!!!!! Making candied nuts for gifting to coworkers ! On my bucket list: A little “me time”….relaxing with a glass of wine and getting “lost” in the white twinkling lights on the Christmas tree….taking a moment to be thankful for all the blessings in my life. There is a Christmas Market every year in my city and it’s tradition for my boyfriend and I to go and get some hot mulled wine. Last year it was really cold and so far the weather has been milder, so we’ll get to spend more time there 🙂 I hope everyone has had a chance to try mulled wine, it’s so good. We are just trying to relax before Christmas. Thank you for the giveaway! Such a great, festive, pretty useful gift! My bucketlist consists of going to NYC to visit my brother and finish Christmas shopping, and baking all of the cookies, cutout butter cookies most importantly of all. Thanks! Before Christmas gets here I want to relax! This time of year is so hectic that sometimes I forget to just breathe, and then I get super stressed out. So this year, I’m putting “relax” on my bucket list. We just picked out our Christmas tree and brought it home. I always have to look at a bunch of them and my family makes fun of me for trying to find the perfect tree. The kids picked out a Charlie Brown tree (muddy and a bit flattened) to fix up for themselves. Lots of baking and a marathon gift wrapping session will be coming up soon. I just have to make sure that when I have helpers I don’t let them see or wrap any presents that are for them by accident. I enjoy my Henckel and Zwilling knives and am sure that I would like the Staub pan. I love your idea of adding in a sprig of pine! I’ve never thought of doing that! I make a similar potpourri every year. A pot goes on the stove the second it turns November. Love it! I really love this idea for the staff at my children’s Montessori school, so I will do that and I love making home made marshmallows and sharing with our neighbors for Christmas. So much on my Christmas bucket list! Lots of homemade goodies to make and bake, but #1 on my list is fancy decorated iced cookies….and maybe letting my two boys help decorate a few :). I’m usually a little bit controlling of my kitchen space ahehe, but I think they’re almost the age where they could have fun with some rolling, cookie-cutting, and (ok course) licking of utensils! St. Jude’s is one of the charities I donate to throughout the year. When my first little guy was born he needed lots of surgeries throughout his first year of life. Even though we didn’t use St. Jude’s, it just made me realize how completely devastating it would be to lose a young child to disease or other medical condition due to lack of funds OR lack of medical progress. They do amazing work there and truly change lives!! And I just have to say how much I LOVE your blog. I think I’ve been following for over two years, and rutinely have multiple requests for your recipes that I make. Thank you so much for sharing your life and and your kitchen! Beautiful!! I bet your house smelled heavenly!! Been thinking about making a potpourri in a pot for some time now, so I guess this is one of the things on my bucket list. We currently live in Dubai, so we are flying back to Europe at the end of the month, and before that I need to buy a lot of spices, dates and other dried fruits and nuts for presents. Then at home, I want to make some nice DIY presents (probably engraved wooden cutting boards) and then just enjoy myself. It will be nice to see all my family and friends again, so I really want to make the best of it. 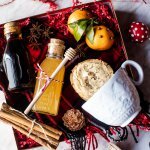 We have a nice charity going on in Slovenia – become a Santa for a day, where you buy a big shoe box of little presents for the children in need. This year we will miss the deadline, so instead of doing this, we were thinking of visiting an animal shelter and help with dogs and buy some food and blankets for them. Tieghan, I wish you and your family happy holidays, lots of mesmerising moments together and of course lots of new readers! Marry Christmas! Making and decorating a gingerbread house is definitely on my bucket list this year! Well, shopping for a Christmas tree was first on my list.. but I can cross that off already, since my husband and I got one yesterday! Yay! I’m always baking this time of year, so that goes without saying. What I really want to do is set up my grandmother’s Christmas village. She’s 88, so we stopped setting it up years ago because it’s a lot of work to take down and she can’t do it alone. The Christmas village is one of my best childhood memories, though, and is worth the effort for the wonder and magic it brings to Christmas. My sisters and older cousins all remember it fondly, but the little ones never got to experience it. Well, I’ve convinced myself- the village needs to go up this year! Before Christmas, I would just like a day of peace. No running around, no working, just peace. Cooking grants me peace, so that’s allowed, but nothing else, just peace. Can’t wait for my son to get here (NC) from college in Ohio. We recently moved here and my son doesn’t feel like NC is “home”. So I suppose my big must do for the holidays are all the things that remind him of “home for Christmas”. Decorating and shopping are done, so now it is time to plan some outings and cook some of his favorite meals. He would love your Standing Rib roast so I am going to make it! Finish my decorating and go ice skating! I still have to make cookies, mail cards and make gift baskets. I volunteer to serve meals on Christmas day at a Senior Center and take a few gift baskets along. 3-pack and decorate gift jars of sugar cookies, brownies, cocoa drink for giveaway! 7-sit down, put my feet up and watch POLAR EXPRESS with a cup of hot cocoa and my hubby and my doggie! Have a MERRY CHRISTMAS AND A BLESSED NEW YEAR!!!!!!!!! Nothing too fancy…I basically want to have time to finish my shopping which never seems done and I would love love love to find time to make holiday cookies for friends and family! I am going to make tons of loaves of sourdough bread and baguettes for all my friends and family. That’s my newest kick!! I have bookmarked so, so, so many recipes that I want to make for the holidays that at this point, I would be happy to make 3 of them. I’m excited to make some home-made gifts to give. Happy Holidays! My bucket list…..when my boys and their girlfriends come home for Christmas, I want them to open the door, see and smell the memories they grew up with. A beautiful tree, twinkling lights everywhere, cookies and sweets ready to be snacked on, lots of hugs ( and probably a few happy tears from mom!). I would LOVE to win one of those gorgeous pots! This year our advent calendar is 24 days of dates! It’s been so much fun already and a great way to connect with my husband during this usually hectic season. I wante to go ice skating yet before Christmas. Oh man, so many things, so little time! -I still have yet to make any gingerbread goodness, which is borderline unacceptable, so top of my list: make ALL the gingerbread confections! -Secondly, (not really something I have any power over, but…) the skies have yet to open up and blanket us with a lovely layer of snow in New Hampshire. I am having minor panic attacks that this may not happen before Christmas. So second on my list, frolic through snow, even if I have to hike up a mountain to find it. -Tree cutting! I’m envisioning finding the perfect tree whilst wrapped in cozy scarves and mittens, followed immediately by steaming mugs of mulled cider toddies. Then decorating the tree between bites of above mentioned gingerbread goodness. -Christmas shopping… *winces looking at calendar* yes, this still needs to happen. -Christmas movie night. Amid more toddies and gingerbread goodness. Snuggled in cozy flannel and warm blankets. Wood-stove fire warming the body and soul. -Finish homemade Christmas presents. So much sewing. So much baking. So much crafting. By Christmas I will be a Cousin It creature covered in stray threads and paper scraps, powdered with flour, and sticking to everything with my gluey fingers. The list could go on and on, but I’d better stop myself somewhere. Spending lots of time with the family playing games and making homemade cooking gifts for the extended family. Bucket List — Try not to wait til last minute to buy Christmas presents. Hopefully get them wrapped and under the tree in time for Santa! -make gingerbread spiced peanut butter for neighbors – done! Bucket list= I MUST make old fashioned, super-molasses-y gingerbread. Yum! My Christmas must-do is to go on a Christmas lights scavenger hunt. The boyfriend and I will bundle up, grab some cocoa, and then go hunting for the best Christmas lights in the neighborhood. I love all the twinkly lights! Family and friends always look forward to the different nut mixes and candy treats that I make for them each year! It’s a must do! Before we travel across the country for Christmas, my husband and I like to have a little “at home” Christmas of our own, with a day of slow breakfast and coffee, Christmas movies, and a walk through town to see all the Christmas lights! Of course, there’s also a lot of baking to be done on my Christmas list! I need to make Christmas cookies! I also think I am going to make your potpurri for gifts. It’s a great gift idea!! I also need to get the tree decorated, asap!!! I just love putting together gift baskets for the people in my life and these little potpourri bags will be a lovely addition, thank you! We are crazy about eggnog at our home, so we are trying to find a great recipe for it and make it! Love your posts. Just watched your roast video. Great! I have so much left to do. Get a tree and decorate. Wrap presents as they come in. Bake gingerbread cookies and decorate. Play Christmas music. Buy last minute gifts with husband. So much fun! Baking Christmas cookies and watching Christmas movies are on my bucket list! On my bucket list? Wander around looking at all of the lights!! I am a 68 year old retiree who has, for the past four years, been housesitting for a hugh school teacher of embassy personnel dependents in Warsaw, Poland. The house is in the Peruvian Amazon (high) jungle in a small rural farming village. The teacher will move back into her home on 1 January. On Christmas eve I am boarding a plane in Lima, Peru to Northern California for an extended visit with my daughter and her family. – Try to assemble meals from what is left in the freezer, the pantry, and visits to the local market for fresh produce. Note: Cranberries hard to find in the Amazon so am unable to use Tieghan’s great holiday suggestions. – Complete the list of maintenace issues in the Amazonian house. Pack mup all my tools. – Purchase enough meds (diabetes and heart condition) to last six months in the US. They cost me about $110 per month here un Peru. Cost for same in US when I left four years ago was well over $1,800 per month. – Finish packing all my earthly possessions in crates and boxes and hauling them to a rented room (most secure I can find in this little village). – Divide what I am taking to the states into 2 suitcases (each less than 50 pounds) and 1 pack. The 2 suitcases contain sweaters and winter clothing for northern California and my kitchen knives (couldn’t travel without them – allowed in checked baggage.) The pack has clothing for the Amazon (80 to 90 degrees F) and for a week in the Andes. – Travel to Cuzco, Peru, acting as guide to a friend on her first trip to Cuzco and Machu Picchu. – Return to Lima to Christmas shop for my two California grandchildren and for flight to US. – Finish reservations for travel and lodging for me and my son from Alaska who is flying down to meet me in San Francisco on the 27th. – Complete the San Francisco itinerary (with addresses and maps) scheduling visits to Chez Panisse (meet David Tanis and Alice Waters), Boudin and Tartine bakeries (yes, I remember, I am diabetic), Christmas dinner of French Onion Soup Gratinée at Absinthe Brasserie, and visits to as many farmers’ markets as possible. – Remember to relax; this is retirement. I’ve already baked cookies, decorated the apartment, watched all the Christmas movies, sent out a Christmas card, planned a Christmas party and bought Christmas records. It’s my first Christmas living with my boyfriend, so I’m just looking forward to a cozy night in exchanging presents, cooking something cozy and feeling loved. ahhh, homemade potpourri! What a great idea! I can’t wait to try this! 02. Have friends over to watch Christmas movies and drink warm, homemade hot coco. Favorite time of the year! So excited!! My list includes baking lots and lots of cookies, put them in nice tin boxes and share with friends and family. I always make too many, but I just can’t help myself. I love trying new recipes and people around me also love their classics, so in order to please everyone, no choice but to make many different kinds!!!!!! So very long list of cookies, but I also can’t go without truffles, fruitcakes, panettone, spiced mixed nuts, ohhhhh, I better stop here and get to it if I want to be ready for Christmas!! That is such a beautiful potpourri; I may have to try making some this year. It has been a tough year for my family so my bucket list for this holiday is to make it as happy and fun as possible. I want to create great Christmas memories. Their smiles are the ultimate goal. This year I want to finally make a specialized holiday cocktail for New Years! My must-do before Christmas is relatively simple: set aside time for a special Christmas celebration with my wife and daughter. I don’t have a lot in the way of “Christmas traditions” (gingerbread house, decorating the house, etc.) – and the only one I do have (decorating the tree) is already done. So all that’s left is to make sure that we carve out time to enjoy it. Lots to do on my bucket list! Still need to get the tree, make Christmas cookies, and finish all the Christmas knitting! Thanks for the giveaway! I love Staub cookware! 2. Make my dear husband’s Christmas stocking! 3. Watch “The Muppet Christmas Carol” on Christmas Eve! neighborhood for over 40 yrs. Weather permitting, it looks so good on Christmas Eve from a hill overlooking our neighborhood! I need to bake lots of christmas cookies and a bunch of goodies for friends and family before christmas! There’s nothing better than filling up the apartment or house with the smell of christmas. I also need to cut down a christmas tree when I come home from college and decorate it. I can’t wait to see the snow in VT and wake up to make homemade cinnamon rolls and chocolate chip pancakes. Im currently in Patho class dreaming about christmas recipes and looking through your recipes! Oops! Thank you for the chance to win the Staub! I have to have some mulled wine! Watching “It’s A Wonderful Life” has been on the top of my list this year being I’ve never saw it! I was thinking about making something like this for the girls I work with! We do little Christmas gifts for each other every year. 🙂 My Christmas bucket list is watching a ton of Christmas movies and baking my heart out! I really need to shampoo my carpets before my family comes over. I also, really wanted to make homemade candles this year for all the holiday gift baskets as well as bake all my holiday cookies for gifting. Yeay! On my Christmas bucket list…COOKIES! The girls in my family get together right after Thanksgiving for Christmas candy making so now it is on to cookies! And shopping, so much shopping. Some year I will get ahead of the game. On my bucket list this year is to bake more cookies than last year. I’m hoping to get enough baked to make pretty trays to give to coworkers. I love your post, I love your blog. So much inspiration!! My bucket list this year is a little different than in the past. We have a young family and are trying to SLOW DOWN around the Holiday season. We want to help our kids pack up some tasty food and treats to bring to our local food pantry, we will bake cookies for our police and fire fighters, we will make small gifts for our family, friends, and teachers. We are incredibly lucky and its time to reflect on that and help others. I love decorating the tree and baking Christmas cookies. It just isn’t Christmas time until I do that! On my bucket list… Celebrate the end of the semester with a Christmas cocktail, bake and eat all of the Christmas cookies, and cuddle up to watch Christmas movies! Oh my goodness, I can hardly wait to be done with classes and exams next week so that I can boil up some of this amazing potpourri and start decorating my house. I must make Bourbon slush! I definitely have a lot of cooking and baking I want to do before Christmas. That looks wonderful!!! I also love the smell of the holidays! The one thing my husband and I always do before Christmas is find an animal shelter that needs assistance and volunteer our time and donate gifts for the animals. Every year between Thanksgiving and Christmas, we go into New York City and stroll down 5 th Avenue to see the holiday windows, have lunch at a small bistro and shop the Christmas markets in Bryant Park and Grand Central station. Since it is the season of giving, we give to all our favorite charities, so they may continue their good work. There are the holiday stalewarts: baking Christmas cookies while watching old holiday movies, eggnog French toast and mimosas Christmas morning, and an orange in every stocking. There’s more, of course, yet these are what come to mind. May your bucket list bring you as much joy as mine. My Christmas Bucket list. I usually always make cookies, last year I made a few cheesecakes but I want to return to cookies this year for Christmas (and maybe do a cheesecake for New Year’s). Snickerdoodles are my favourite and must always be done and I want to make soft chewy oatmeal cookies, and chocolate chip cookies. Just loads of cookies. We have a Christmas cookie jar to put them in. Oh I also need to decorate/label the stockings, we bought some cheap ones from the wholesale store and need to put our names on them, and the cat’s, she got a stocking too :D. I also need to mail out Christmas cards and I think the deadline is the 10th if I want them to reach by Christmas :o. So I’ll be get cracking on those tonight. I came across your beautiful blog on Pinterest and I am so glad that I did! I can’t wait to make the potpourri for myself and to give as gifts this year. On my bucket list, I want to do so much, but feel like there isn’t enough time to do it all. The things I am going to be sure to do, is put my 2nd tree up that we do every year and my 14 yr old daughter and I bake all different yummy Christmas cookies as we blast Christmas music and dance around the kitchen, so much fun! This is my favorite time of year and you have such great ideas to make the holiday even more special, so I thank you for taking the time and doing that! Happy Holidays to everyone!! What I have to do before Christmas is get funds together to make my 92 year young mom her favorite Cuban meal. For myself, I would like to put up my tree on time and go Caroling. After I finish decorating and shopping, I want to make some food gifts for my neighbors (or maybe potpourri). and most importantly, prep for our family Christmas celebration which we will do on December 18th – the only night we can get all 3 grown kids in one place! What an awesome giveaway! I definitely want to make some cookies, and I must get a pair of socks finished for a Christmas present. My roommates and I have a funtivities bucket list this Christmas: the tree at the capitol, mulled wine, sleigh ride, decorate gingerbread houses, and bake cookies! First on my Christmas bucket list is finding 365 ways to thank my husband for the care he took of me all this past year while I (and he) was enduring unspeakable back pain, surgery, infections, infusions, more pain, and almost complete disability–now over, thank God!! I know cookies will go a long way toward the goal, as will lobster thermidor on Christmas Day. But I’m short about 300. Second on the list is getting the three refugee families I work with into decent housing. One of whom is Syrian–and in Georgia, under attack for existing. Third is helping the Global Village Project–a school for refugee girls that I helped start six years ago–meet its fundraising goals. Also, I hope for inspiration or determination or SOMETHING to help me cull out some of my 500 cookbooks. Beautiful post! Before christmas I would love to wake up early some weekend and make a big batch of lemon pancakes for my family, and then sit together for a long lazy breakfast. Tieghan your pictures are amazing! I love the light you capture and the coloring that is unique to your shots. You are definitely gifted with a special talent and I’m so glad you found a wonderful outlet for a lot of people to enjoy your blog and cookbook. I have a group of elderly friends that I always make a special point to visit this month. I like to bring flowers or a baked goody. I just made an English Pudding Cake to take to my friend Neva who is 91 tomorrow. A dear lady with a vibrant spirit. Take care and Merry Christmas to you and your clan! Your potpourri sounds Heavenly! And, what a fun and creative gift to give. I’ve gotta add those to my list of giving this year! My bucket list is to try a new biscotti recipe. For the last few years I’ve been stuck on cranberry, pistachio, and white chocolate. Totally speaks Christmas, right?!? Well, I’ve got my eye on a gingerbread and almond biscotti. Or maybe fig and Greek yogurt….hmmm. Love your blog! I’m looking forward to trying your rib-roast for Christmas-eve dinner. My Christmas bucket list includes baking and making gingerbread house with my girls. We skipped last year because we went out of town for Christmas, and my daughter’s been talking about how much she enjoys the tradition. Oh MY GOSH!!! This is amazing! I want to Make this definitely before christmas! Also this is first on my Christmas Bucket List! Go Ice skating downtown! This Christmas I am going to keep playing secret Santa as long as I can! At the office, in my neighborhood, and with my family and friends! Number one on my Christmas bucket list is to watch White Christmas. I haven’t gotten to it yet this year, but I watch it at least once every holiday season and if I don’t see it before December 25th then it’s just not Christmas. I want to do all sorts of things before Christmas — most involve cooking copious amounts of cookies, candy and fudge for all my friends! I actually just want to take some time just to sit with my family in front of the fire, hug them all, and tell them how much I love them. What a nice idea! I plan on making these to bring as a hostess gift for an upcoming Christmas party! The one thing I must do before Christmas is make pierogis with my grandmother for our Christmas Eve Wigilia dinner. My grandmother is 95 this year, so being able to make those delicious little potato and sauerkraut dumplings together is such a meaningful part of the holidays. My bucket list – (1) finish decorating all 5 Christmas cakes that I’ve been told I have to make this year. At the top of my bucket list? Watch Christmas Vacation, Love Actually and Home Alone (maybe even a double-feature with Home Alone 2)…while eating ginger cookies and sipping from enormous mugs of pumpkin hot chocolate! These photos are gorgeous! I would love to have this simmering on my stove top right now! 3. Eat my mom’s cinnamon rolls on Christmas morning. 1) I love your posts. Your food is my spirit animal (sorry if that’s weird) and I love your photography. I graduated with a photo degree and just love your look! I want to eventually get into staging and possibly food photography and your stuff is seriously an inspiration! 2) Bucket list=family recipe GUMDROP COOKIES. It’s a family recipe we only make at christmastime and they’re the best cookies ever (secret ingredient=lard). My bucket list is taking my annual christmas picture – we started the first year of dating and now is our first year married! Oh lord my bucket list is huge! But here goes! Once December 18 is here I want to bake something every day…cookies, pies, fudge, cake…yes! I already have my family sending holiday requests. Go shopping with the family (one at time…more covert that way 😉 because it’s always entertaining and those are the memories that last! Watch holiday movies with my cousin until the wee hours in the morning drinking wine and cookies, and laughing about our ridiculous and A-mazing cousinisms (silly quotes/inside jokes…yes we made up a word for it…lol)! Walk, run, or move in general so I don’t end up looking like an oompa loompa. Cuz yes, I can stuff my face with delectable sweets like the best of them. READ. For some reason I’m in the mood for a sappy historical romance novel, especially if it’s set during the holidays or just winter. Wait…what?…no…yeah…I just said that. Help someone in need. My boyfriend and I always choose a child from the Angel Tree and buy presents for them. This year I’d like to do something a little extra. Not sure what yet. Serve food at a homeless shelter? Spend quality time at a nursing home? They all sound good to me. Dance with my man until my feet are sore on New Year’s Eve. Then watch the fireworks cuz I’m a girl that likes all things that sparkle and shimmer. #1 item on my bucket list is to FINISH our 2014 SCRAPBOOK ALBUM. My 6-year old is soo looking forward to flipping and reminiscing…… Thanks for the giveaway! If time allows I’ll give the potpourri recipe a try! So many to count! But I absolutely have to watch National Lampoon’s Christmas Vacation, snuggle up with my 3yr old nephew and watch Muppet Christmas Carol and sit down with my family in front of the fire and have a great bourbon based cocktail. Wishing your family a Merry Christmas Tieghan! I want to make homemade vanilla extract before Christmastime. 4) And make gingerbread cookies for Santa of course!! great giveaway, those pots are beautiful! I want to make lots of christmas cookies, especially gingerbread . Merry Christmas Heather! I am looking forward to my first Christmas grand baby!!! Just discovered your blog – it’s delightful! On my bucket list for Christmas? Watch “Elf” with my daughter when she gets home from college, make almond roca for our friends and neighbors, and find this year’s ornaments for each family member! My bucket list includes spending time as a family as my oldest is away at university and will be home soon. A ski trip as a family would be right up there as something I would love to do. Uninterupted time together in the great outdoors! Thank you for all of you’re inspiration and ideas. I have your sage crusted roast in the oven as I write this. So excited for dinner tonight!! Oh, I have lots of things I want to do before Christmas! Some include: make homemade treats for gifts, book a honeymoon (! ), and organize my recipes (right now they are shoved in a drawer). My husband and I cut down a Christmas tree from a farm this year, which was on my bucket list. So fun! I have to watch the movie Elf. I’d also like to go see the tree down at Rockfeller Center in NYC, but that probably won’t happen until after Christmas! My “must do” before Christmas is to finish my first ever knitting project for a Christmas gift! Knitting is a new hobby for me, and I’m just getting good enough to feel comfortable gifting the projects 🙂 thank you for a chance to win! On my Christmas bucket-list: I want to bake and decorate gingerbread men, and also find some new Christmas ornaments for our tree this year! I usually don’t comment on stuff like this but I’ll give it a try. Before Christmas, I want, (and need to) finish shopping for Christmas dinner and finish buying presents for everyone. I also want to plan my trip to Oregon and Washington that I will be taking right after the holidays. I started following your recipes after I came across your crockpot ramen soup, which was awesome! Since then I feel like I usually make something from here every other week. A new pot would be awesome to have since 1) I just graduated from college and don’t have too many cooking supplies, and 2) the day you pick is actually my birthday! I have a long list of baking projects to attack when I get to my parents house for Christmas, including peppermint marshmallows and gingerbread in as many different forms as possible! I want to bake pumpkin rolls for everyone! The only thing on my list to do by Christmas is to tell each of my family members how grateful I am to have them in my life and to thank them for being themselves! Oh goodness, I love the potpourri idea. The one thing I really really want to do before Christmas is make cookies with my kids. They are great ages this year and I know it would be so fun. MUST send out Christmas cards!! My MUST list is finishing shopping and wrapping before kids come from college next Thursday! Ice fishing with the family with a bonfire on the lake. Gingerbread house building contest and Pirate Gift exchanged with friends! My bucket list Christmas to do item is to fulfill my 3 yr old’s request to make Fudgy Mint Cheesecake Squares. How could I say No? On my to do list is to tell each of my family members and each of my friends that I love them and just how much they mean to me ? ? ? ? I have a lot to do in a little amount of time! Most importantly, i would like to make some baking memories with my daughter. The most important item is to finish up my holiday crafts, making the annual ornament and a art project for a gift. Enjoy the holiday season! My bucket list items include: finishing up a few handmade gifts (I tried to make something for my friends this year instead of buying things), as well as making an epic gingerbread house! My bucket list: Complete Christmas cards and/or phone calls. Finish posting all packages and mail. Find a good iron skillet — this is where you come in [smiling]. (My big hearted son gave my “cheap” iron skillet to my grandson today.) And my happiest challenge is to find a dog (not a puppy) as a gift to myself for Christmas. Since all my family will be away, I plan to find him/her (the dog, not a romance) before Christmas. That way, he/she will have my full attention and I won’t have time to become a sourpuss. Thank you – this totally inspired me to get a pot of potpourri simmering! And before Christmas…we have five young daughters who are anxiously waiting to go get a tiny Christmas tree from the woods for their bedroom. I remember doing the same as a little girl and loving. So it’s a must! Perhaps tomorrow. I want to spend a quiet night watching Christmas movies. I have to deep clean the house. My mother in law is coming! My big bucket list hope is to get all 6 of my children and their families in my home at the same time to celebrate Christmas. On my bucket list is to make a bunch of cookies and get out to ice skate and enjoy the season! I love St. Judea and what they do for children and their families. They are a charity I try to support throughout the entire year. Take a Christmas Light tour! I love this post! I’m dying to try stovetop potpourri this year. My bucket list includes: giving to a local charity, picking out a real tree (but mini, tabletop size!) with my mum, listening to The Carpenters Christmas albums, and enjoying our local festival of lights (an amazing Christmassy neon light display along our riverfront). To finish knitting my Christmas gifts. See Star Wars with my son on Thursday. Bake Merry Cherry bars and macaroons. Decorate the tree. This year I knitted the ornaments! Go to the post office, stand in line, and hope I didn’t forget any addresses! Pray that the Yoda and Darth Vader gingerbread men look as good as they taste! Make an awesome Christmas dinner while sipping Tom and Jerry’s! Watch animated vintage Christmas cartoons with the family. My Christmas bucket list obviously includes baking cookies — I bake my (and my best friend’s, boyfriend’s and dad’s…) favorite: spiced oatmeal and cranberry cookies. I’ll box these guys up before Christmas and send them to my dad and he’ll box up the Christmas cookies he made and send them to me. He lives in Pennsylvania and I live in Massachusetts so it lets us start celebrating a little early. We love the preparation leading up to Christmas and it doesn’t feel like the holidays without a little cookie swap across state lines. I’ve already baked all my cookies for family and friends. This year I am bringing back an old tradition for many years of breaking a couple of different types of bread for family. I stopped doing this about 10 years ago, because it seemed like live got too hectic this time of year. But, I miss the process of baking bread from scratch and people LOVE receiving homemade bread…so bread it will be for my Christmas Bucket List. Oh and of course, there are my homemade Christmas cards. I started those back in October. They mailed tomorrow! I follow you on pinterest and today I became a subscriber. I really like your blog. Our week before Christmas is about people, not presents. We call “older friends” who are away, we share a meal with local friends, trying to spend special time with each one. It’s our special gift—-to ourselves also! As a native Memphiam, St. Jude has been our special charity for almost 51years! Merry Christmas! oooh I am thinking of making this a classroom project for fourth graders! How fun for them to take home and have the smells in each and every house! Thanks so much for the instructions……a great idea!!! That sounds like such a great idea! And something I am sure their parents will enjoy! Let me know how it goes Cindy! Thanks! Okay I’ll try that out! Thanks! This year I am having all my family (35 or so) to my rural Colorado home and i can’t wait. I am planning the menu and the schedule so that I can coast into the Christmas Event without breaking a sweat! So much to do, but I too love this time of year and with planning and a day by day schedule I can get everything done without too much stress. That sounds so great! I hope you have an amazing holiday and everything goes well! Let me know if you have any questions! On my pre christmas bucket list – Christmas cards! I know it takes time and is “old fashioned” but they are always appreciated and a way for me to stay in touch with family and friends across the country. I love that you still send Christmas cards! I used to love to see all the ones we got from other families! Thanks Brenda! 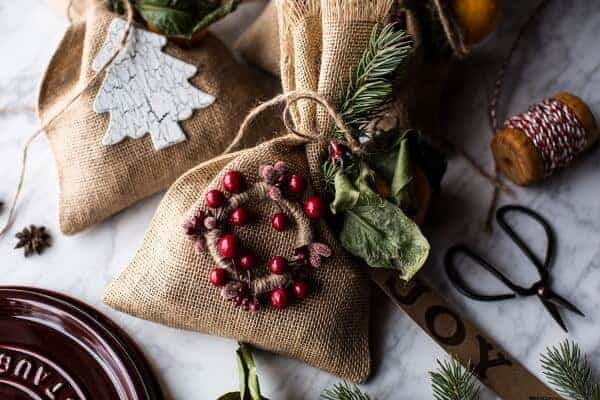 Before Christmas my goals are to bake some cinnamon ornaments for the tree, cut out/origami some snowflakes to hang around the house and make at least two cosy cocktails to enjoy with my hubby!! On my bucket list: Get everything done early so I can enjoy all the fun things with my family, like baking cookies, going to Christmas events and shows, putting the tree up early, decorating the house and having fun while doing it, rather than feeling stressed about the deadline of Christmas. Yes! That is a great idea! The holidays are all about being with family, so getting everything done in advance would allow you to do just that! Happy Thanksgiving! Great idea! Going to try this. I couldn’t find a link to the video though, which would be useful! Please could you share a link if it is still online? I’m taking the time to really enjoy the decorating, wrapping, and baking that goes along with Christmas. I am inspired by beautiful blogs such as yours. I’m so happy to have found your site. I am so glad you found it as well! Thank you Rosemary! What a delectable recipe! I’m just trying to decide exactly why I’m not drinking it…. so before Christmas, I am hoping to light my entrance path cheerily and sufficiently enough that my mother feels confident walking up it(! ), seriously clean the plac we’ve just settled into and prepare some sweet gifts with my three teens to share with our friends. This potpourri, for some, and maybe some homemade jar votives, packed with peppermints or such for others. Enjoying considering the possibilities. Thank you so much for your creative contribution and encouragement to share joy and prosperity ! Yes, every year I have a Christmas wish list… Of things I want to DO, not receive. Similar to your list- baking, homemade gifts etc etc. Living in South Florida prevents the “cut down a real tree” theory, lol. Even though I’m no longer working, I never finish the list… Sometimes,I can’t even begin it. I spent a lot time caring for a loved one with cancer over the last few years (my best gift to self, ever) and this year, I spent much of the last month preparing for a double baby shower for my daughter and daughter-in-law… Only to have them both snowed in up in Georgia and unable to attend! And, my husband and I rented a moving truck to bring my daughter’s furniture up to her new home. So, my Christmas wish list??? Make it back to So Fla safely this weekend, make amends to the puppy we left behind with friends, put up the Nativity creche, get your potpourrie simmering , take a nap and pray for a blessed Christmas NEXT year with two new grandbabies!! AMEN. Hi Ann Marie! I hope you do make it safely to Southern Florida this weekend and have a great time getting ready for the holidays. Also, I really hope you can do some of the things you are wishing to do this Christmas! Oh and congrats on the grandbabies! That is SO exciting! Thank you & Merry Christmas! I am trying to be mindful and slow down and enjoy every single moment of this time of year with my family and friends. We are taking the kids to Disneyland in 10 days!! I love their little faces so much. I can’t wait. I love that! I hope you have an amazing holiday season, Donna! town square, park, or center. Can’t wait!! The highest priority on my Christmas bucket list is to find a way to close the distance between my son on the opposite coast. He can’t make it home for the holiday this year so I working to pack up elements of our familiy’s traditions (tree cutting, decorating, special Christmas Eve activities), gifts that delight and deliver it with essence of me, my daughter and our dogs It’s a challenge but we are approaching it with love and laughter (also a family tradition!) The potpourri is a great idea! YES! I love these ideas! Thank you Amy! My bucket list includes attempting to make little glitter putz houses as well as baking sugar cookies! YES! I love that idea! I hope it turns out amazing! Make new treeskirt in Buffalo plaid with matching stockings! Spending As much time with my Son outdoors ; going to Brookfield Zoo, Morton Arboreteum, Museums in Chicago here in The Midwest. Who just got home from serving 6 years in the United States Air Force. Wow that is amazing! Tell him thank you for serving! So many things to do before Christmas: choosing the tree, decorating the house, baking Christmas cookies and making homemade gifts, being criative trying to reuse and have environmentally friendly gifts! I hope you have the best time doing all of those things, Isadora! I love the idea of using environmentally friendly gifts! I love this idea and plan to try it this year as gifts for friends. How large are the burlap bags you use? Hi Tiegen. Thank you for your very generous opportunity! My Bucket List item to complete is a family shopping day on December 15th. Myself, our three Daughters, and five Grandchildren ranging in age from 9- 16 have decided that we all have enough! So this year, in lieu of gifts to each other, each family is contributing a certain amount of money and we are doing a Toy Shopping Day together. Each Grandchild will shop for a child their own age, and all of the merchandise will be donated to a local organization in our Community who supports families in need. It’s going to be a great family day of giving and sharing time together and we are all looking forward to it. Thanks again. PS We already donate to St Jude’s and share your view of them as a wonderful organization to support. Hi Jackie! This is so amazing!! What a nice idea to teach your children to give on the holidays! I hope you have a great time shopping for all of the gifts! Thank you! I want to make gingerbread people, do up a gingerbread house with our 2 year old, get Santa photos done (I know, I know we’re almost missing the mall Santa), and I want to get my “mistletoes” canvases done as Christmas gifts to the girls grandparents 💕 that’s my bucket list! Sounds so amazing! I hope you have an amazing time doing all of these things! Hi Teighan ! Quick question, should the pot pourri with fresh fruits be kept in the fridge before being gifted or by the person receiving the gift – or both ? Thanks a lot ! I think I need to add your Christmas Potpourri to my list. Sounds (and smells, I’m sure) delicious. In addition to that…. Blessings for a glorious holiday season! Sounds amazing! I hope you have a wonderful holiday season Ruth! 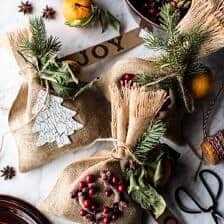 This Christmas I definitely will add potpourri-ing to the list – this homemade gift looks easy but yet very thoughtful and I can send to anyone far away! Next on the list is making chocolate truffles for everyone who is super close to me, it’s a tradition I bake something new each year and 2018 is truffles!! And lastly, I have to develop all those Kodak films – yes, I carry those disposable cameras still with me and I must say people love seeing them when I take it out to snap a photo. These are great gifts to those who were in the photo to be sent one or two – it’s vintage, compact, and something unique about me that I love to share with those I love. Wow truffles sound amazing as a gift! I love that! I hope you have an amazing holiday season Emily! Awh that sounds so wonderful! I hope you have fun! Wow wow wow! This sounds magical and so fun! I hope you have a great time Lauren! Go look at holiday lights! Sounds so amazing! Thank you so much! On my bucket list of things to do is to finally move back home! We lost it in hurricane Florence on September 12th. So excited and humbled to truely be home for the holidays! We will be enjoying your turkey and wild rice pot pie on Christmas night! I am so sorry to hear that Lacey, but I am so glad you are finally able to move back home! Thank you so much! I hope you have a wonderful Christmas! I have so much to do…..still need to buy gifts, wrap & mail gifts, bake more cookies, and plan for a family dinner, but the most important thing I need to do is go to yoga. It keeps me sane! I am sure you will get it all done! The holidays are amazing, but can be hectic! Also, yoga is a great idea! 4.to make your potpourri- my house heated with a woodstove, and that will be so totally cozy to have a pot of potpourri bubbling away on it! Wow that will be so cozy!! I hope you have an amazing time with all of these things, Melissa! I was all excited to try this, but the “old and lame” comment bummed me out. It’s not cool to stereotype older people that way, just like it’s super ignorant to assume all people under 40 are “young and dumb”. There are many vital, awesome people well into their 70s and 80s, right? Old doesn’t mean lame. No idea what you are referring to?